This product contains a unique blend of combined Essential oils especially selected and synergistically combined to improve the quality and health of the hair. Using Natural oils of Avocado, Wheatgerm and Jojoba, which work in harmony to enhance the shine and health of the hair. detoxifying properties, and is loaded with good fatty acids which get absorbed by the hair follicles to improve hair strength and shine. Avocado oil further nourishes the strands of hair to give a silky-smooth feel. Coconut oil has been added to enhance the nourishing and moisturising properties of this product. Wheatgerm oil has long been known to improve the overall health of the scalp which in turn produces healthy hair strands and promotes hair growth. Wheatgerm oil also improves the volume of the hair, giving a fuller lusher appearance. Jojoba seed oil has been incorporated into this formula as it controls hair loss by stimulating hair growth within the hair follicle. 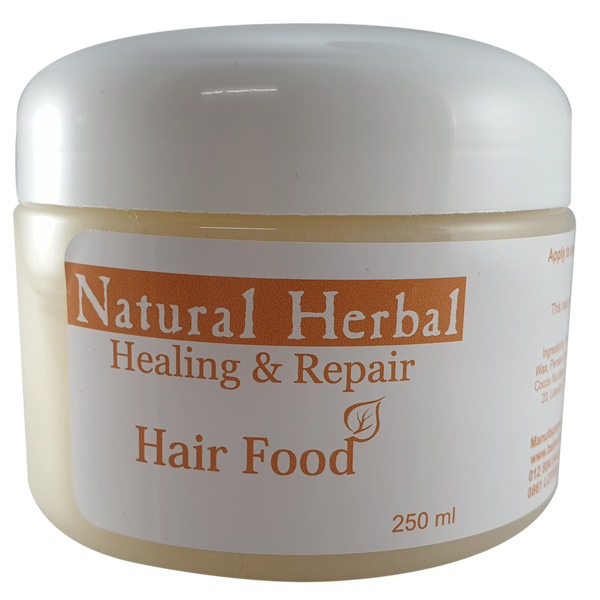 It furthermore cleanses the hair follicles by dissolving the sebum and other debris providing a smooth clean follicle which also enhances hair growth. Rosemary Leaf Essential oil has been incorporated into this product as it has a stimulating and soothing effect on the scalp while enhancing blood flow to the hair follicles. Rosemary Essential Oil also acts as an antioxidant which reduces the damaging effects of tough chemical treatments and damage caused by Polluted City living, leaving the hair smooth, silky and full of shine. Apply to towel dry hair. Place product into the palms of the hands, rub vigorously and then massage into the scalp. This is a leave on treatment. Fresh clean scented hair with a soft smooth shiny appearance.